This revolutionary antioxidant hydra-­serum, with a high concentration of Ascorbyl Glucoside, an incredibly stable form of water-soluble Vitamin C that exhibits high antioxidant activity, aids in the synthesis of collagen while inhibiting the formation of melanin and effectively protect and repair the skin from free radical damage. Ferulic Acid, a plant-based antioxidant with sun protective benefits enhances the stability of vitamin E, is shown to have anti-inflammatory effects and most importantly helps inhibit UV-induced melanogenesis (pigmentation caused by the sun). A few luxurious drops of this powerful active targeted magician, penetrates deep to bring about youthful looking skin with lavishly age-defying results. An incredibly stable form of water-soluble Vitamin C that exhibits high antioxidant activity, aids in the synthesis of collagen while inhibiting the formation of melanin and effectively protect and repairs the skin from free radical damage. Skin lightening ingredient and potent antioxidant derived from turmeric that inhibits tyrosinase, blocking the synthesis of melanin in the skin. A potent antioxidant with powerful anti-inflammatory benefits that helps prevent collagen breakdown and reduce UV damage. A plant-based antioxidant with sun protective benefits. It enhances the stability of vitamin E, is shown to have anti-inflammatory effects, and most importantly, helps inhibit UV-induced melanogenesis (pigmentation caused by the sun). Also known as licorice root, this potent plant extract helps inhibit tyrosinase activity to improve skin discoloration and hyperpigmentation , effectively evening skin tone for a brighter complexion. Also functions as an anti-inflammatory and anti-irritant to help reduce the redness and irritation associated with various ailments like rosacea, psoriasis and acne. A natural antioxidant and anti-inflammatory that naturally brightens the skin, inhibits melanin production to even out skin tone and defy the effects of aging. 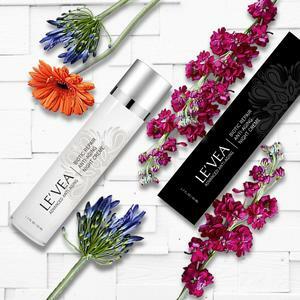 A powerful, lipid-soluble antioxidant superstar that protects the epidermis for UV radiation and damage, prevents cell membrane peroxidation, while reducing transepidermal water loss which leads to improved skin barrier function. Special combination of high- and low-weight hyaluronic acids that expand once in the skin to provide excellent, long-lasting hydration. A glycosaminoglycan capable of binding 1,800 times it’s weight in water, when applied to the skin it forms a water-binding barrier allowing for increased moisture retention in the skin’s intracellular matrix.